Lot 7. Calabria, Taras. ca. 290-281 B.C. AR nomos (19 mm, 7.49 g, 2 h). 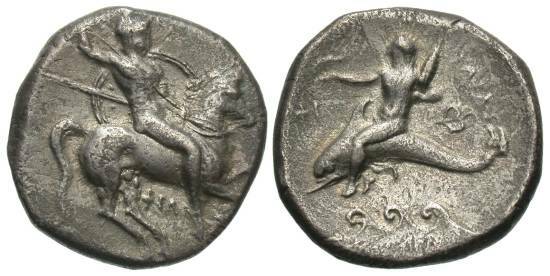 Helmeted horseman charging right, brandishing spear and holding shield; belwo, ΦIΛI / TAΡAΣ, Taras riding dolphin left above waves, holding dolphin and distaff; to left, ΦΙ; to right, ivy leaf. Fischer-Bossert 1088 (V409/R839); Vlasto 589 (same obverse die); SNG ANS 989 (same obverse die). Toned, very light graininess. Very fine.